The Gulf of Mexico’s bounty can be transformed into much more than gumbo with a little creativity and some inspiration from local chef “Panini Pete” Blohme. 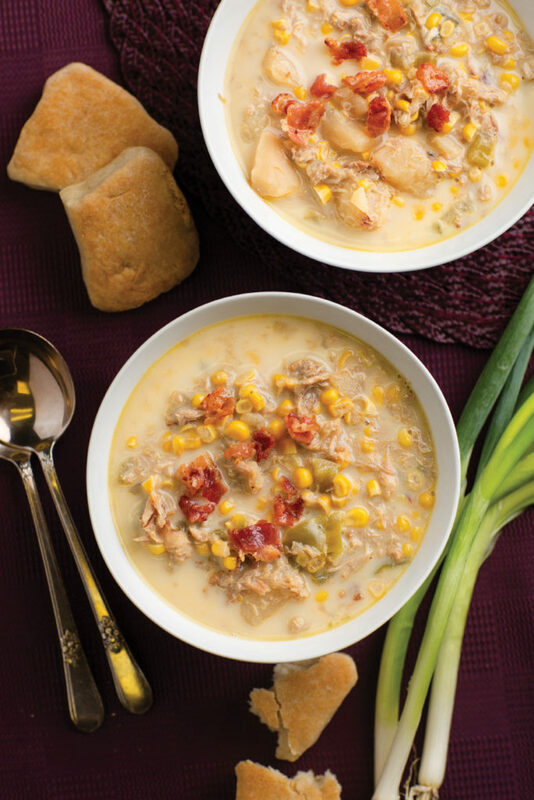 Gumbo is the stew we all think of when we envision Gulf Coast cuisine. A deep, rich roux blanketing shellfish, vegetables and plenty of spice; sometimes served over a bed of rice, sometimes not. Fresh local seafood builds the dish to a level the area is renowned for, and with good reason. 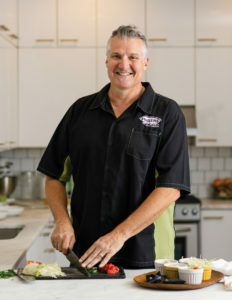 However, when chef Pete Blohme, of Panini Pete’s fame, developed the Sunset Pointe menu, he specifically chose not to include gumbo in the lineup. Instead, he positions familiar ingredients in a new light to create traditional dishes turned Southern. 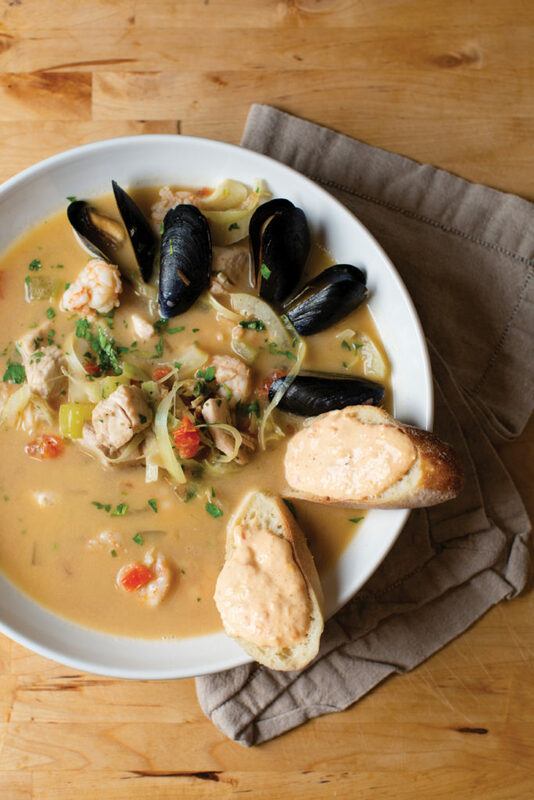 Blohme’s nationally recognized bouillabaisse is almost synonymous with local celebrity. 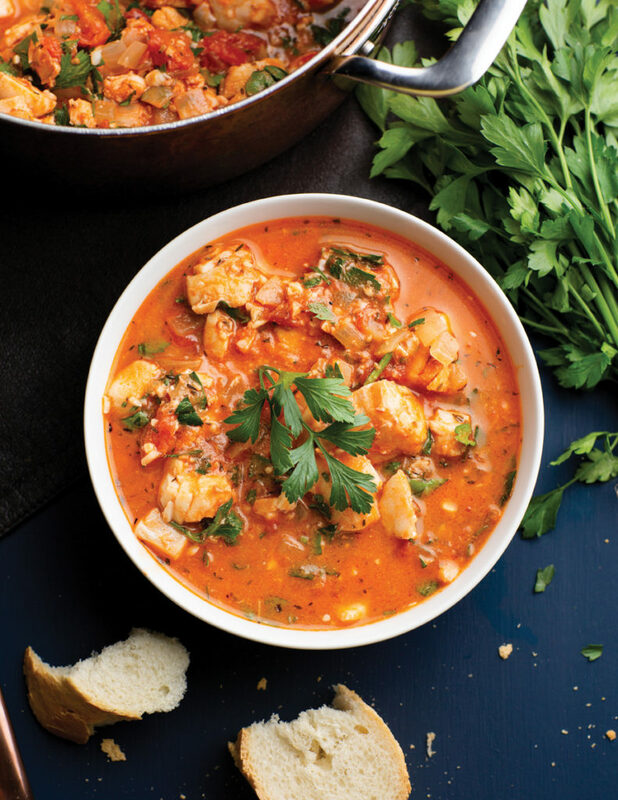 Dubbing it “Eastern Shore Bouillabaisse,” though, makes it seem less Marseilles-influenced and more locally appealing. “You want something familiar enough that you can coax people to try it,” says Blohme, who amps up his bouillabaisse with local ingredients. The ingredients in his seafood stew are locally sourced and seasonal. Blohme utilizes by-catch seafood and integrates the lesser-used scraps to build flavors in the broth or add bulk to the stew. The maximization of products encourages sustainability to keep Gulf Coast fare available for years to come. And what’s more, these dishes don’t need hours to pull together — the line cooks at Blohme’s restaurants prepare the bouillabaisse “à la minute,” meaning quickly made to order and served immediately. If they can do it under the pressures of a commercial kitchen, you can do it in your own home, too. Chef Blohme prepares this dish to order at Sunset Pointe, but the recipe can be multiplied based on the number of servings needed. 1. Heat oil in a large pan until smoking hot. 2. Quickly saute shrimp, fish and shellfish. Season with salt and pepper. 3. Add garlic and shallots and cook until softened. 4. Add leeks and fennel and cook until softened. 6. Add red and green tomatoes at the very end. 7. Finish with butter and garnish with chopped Italian parsley and fennel fronds. 1. Toss fish and shrimp with 1 teaspoon olive oil, 1/4 teaspoon salt, 1/2 teaspoon paprika, lemon zest and 1 clove garlic. Set aside. 2. Preheat oven to 400 degrees and a large oven-safe skillet to medium-high heat. 3. Crumble chorizo into skillet and cook for 10 minutes until fully browned and cooked through. Remove and set aside to drain. 4. Add up to 1 tablespoon olive oil to skillet, depending on how much oil was rendered from chorizo. Reduce heat to medium and add onion, celery, carrots and bell pepper. Cook for 10 minutes until softened. Add remaining 4 garlic cloves and cook 1 more minute until fragrant. 5. Make a well in the center of vegetables and add tomato paste directly to skillet. Stir and cook 2 minutes until deepened in color. 6. Add stock, wine, 1 teaspoon paprika and bay leaves. Cook 5 – 7 minutes until reduced by half. Season with remaining salt and black pepper and remove bay leaves. 7. Stir in chickpeas and cooked chorizo, then nestle fish and shrimp into broth. Bring to a boil then immediately roast in over for 10 – 12 minutes. Broil for 2 – 3 minutes to brown seafood. 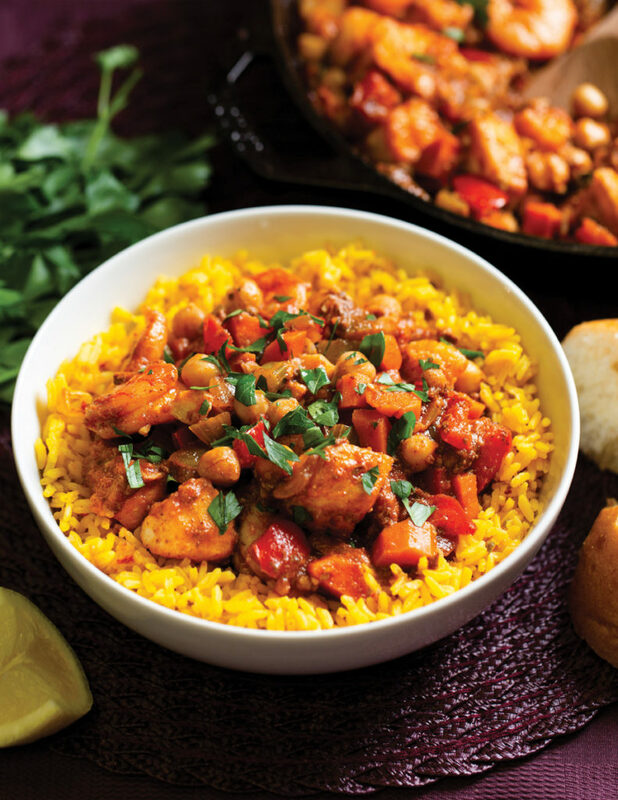 Serve over saffron rice and garnish with parsley. 1. Place bacon in a cold skillet. Turn burner to medium heat and cook, flipping occasionally, until crispy. Set aside one slice for garnish. 2. In a 4-quart slow cooker, crumble remaining 3 strips bacon. Add onion, bell pepper, celery, potatoes, corn and crabmeat. Cover with chicken stock. Season with butter, salt and pepper and cover. Cook on high for 4 hours or low for 8. 3. Turn off heat and stir in half and half. Divide into bowls and stir in parsley. Crumble remaining bacon on top and serve warm. 1. In a large pot, heat oil over medium-high heat. Add onion and cook 3 – 4 minutes until translucent. Stir in garlic and cook 30 seconds until fragrant. Add parsley and cook 2 minutes more. 2. Combine tomatoes with juices and tomato paste with onion mixture. Reduce heat to medium and cook 10 minutes, stirring occasionally to prevent sticking. 3. Add clam juice, white wine and fish to pot. Simmer 3 – 5 minutes until fish is cooked through. Season with herbs, hot sauce, salt and pepper. Serve warm.